When we have to recite the name of the one who churned the ocean, should we not see him in person and then recite? For those who say that only dhEvas (celestial people) can see and attain him, AzhwAr says that in order to remove their grief and to enable them to attain him emperumAn has taken residence in thirumalai. padaiyArum vAL kaNNAr – women with eyes like a [sharp] spear and having a bright radiance. The word padai refers to sword; hence it can also be construed as women with eyes sharp like a sword. The opinion here is that these women, whose beauty is such that others would desirously come and attain them, are attaining thirumalai (the divine hills) themselves. paim pUm thodaiyalOdu Endhiya dhUpam – since these are young girls, their focus could shift to worldly pursuits. 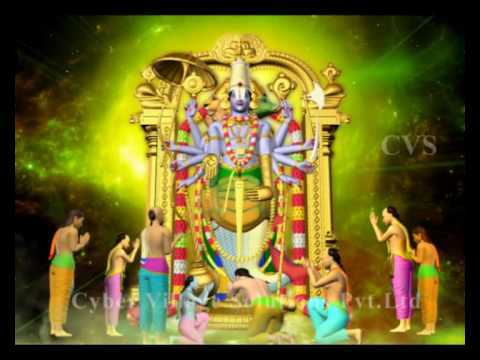 thiruvEngadam (thirumalai) has such a quality that instead of their straying into worldly pursuits, it is making them come to thirumalai and worship emperumAn. The beautiful garlands that these girls have strung are to be offered to emperumAn. They are also carrying fragrant smoke with them for worshipping emperumAn. idai idaiyil mAsUNum vEngadamE – The smoke carried by these girls causes stain on the sky [over the thirumalai]. The garlands that they are carrying hide the starts that keep coming now and then in the sky. mEl oru nAL mAn mAya eydhAn varai – in an earlier time, emperumAn engaged in an activity for sIthAppirAtti in SrI rAmAyaNam. She desired to have a deer that came near their hermitage. SrI rAma, to fulfil her desire, went after the deer, and had to kill it. It is said that emperumAn will help these girls who have come to thirumalai to worship him. thirumalai is the residence of emperumAn who engages in activities for the sake of his followers, being at their disposal [as evident from the above mentioned incident]. It is mentioned in this pAsuram that this hill is the residence of emperumAn, who has no shortcoming in the qualities of being simple, being at the disposal of his followers, being sweet and capable of disposing of the enemies of his followers. We shall move on to the 83rd pAsuram next. This entry was posted in iyaRpA, mudhal thiruvandhAdhi on August 31, 2017 by T N Krishnan.